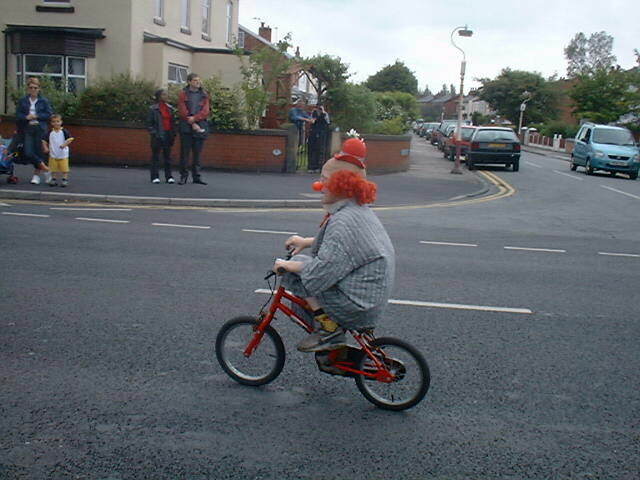 This story had me at "blackmailer in a clown suit," but the riding of a tiny bike moved it to the top of the list. Frank Salvador Solorza was convicted recently of conspiracy, attempted extortion, and impersonating a federal officer, according to this post in the San Francisco Chronicle. I've done my best to interpret the story as suggesting that he tried to impersonate a federal officer while wearing a clown suit, but I don't think that's what happened. Instead, he seems to have done the impersonation from a distance and then put on the clown suit only when it was time to pick up the money. Prosecutors said Solorza was trying to extort $50,000 from a Bay Area family by making calls and sending letters purporting to be from a U.S. immigration agent, accusing the family members of lying on their applications for permanent residence and threatening to have them deported. The messages told them that if they paid $50,000, their papers "would be good forever." The family contacted actual federal agents, who then recorded subsequent calls providing instructions in how to hand over the money. "The family was told in one call," the report says, "that a man in a clown suit and riding a small bicycle would be coming to pick up the money." I guess there is a touch of genius to that plan, because ordinarily you don't look at a man in a clown suit riding a small bicycle and think, "hey, there goes an extortionist." But it's a pretty high-stakes plan, because it's anything but low-profile. Hiding in plain sight like this can be a good strategy, but not when the feds are already watching you. 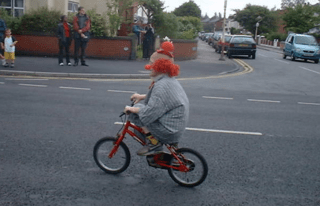 And, in fact, agents watching the family's home in February 2009 did indeed see someone ride up to it on a tiny bike, wearing not just a clown suit but "a clown suit, a clown glitter wig, a Pirates of the Caribbean hat (complete with dreadlocks), and sunglasses." By itself that seems like pretty good circumstantial evidence that you've got your man, but they waited until he actually picked up the briefcase he thought was full of money, and then arrested him. He was carrying the cell phone from which the calls had been made, and "a receipt from the House of Humor costume store in Redwood City," when he was arrested. A jury convicted Solorza, and on Wednesday the judge sentenced him to three years in prison. She does not seem to have credited his story that members of the Norteño gang had forced him to try the scam. "Norteños always dress in their colors," prosecutors wrote in a sentencing memo. "They don't use disguises, let alone engage in crimes wearing clown suits." Objection, Your Honor — counsel has no foundation for that statement. They've offered no evidence this group's "colors" don't include glitter wigs and Pirates-of-the-Caribbean hats, and so I move to — yes, I'll sit down. It is possible that Solorza felt the full clown regalia was necessary to justify the makeup (that I assume he was wearing) and sunglasses. He needed to obscure his identity because he's related to the people he was trying to extort. It appears that they suspected him to begin with, though, because about two weeks earlier he had nonchalantly asked them when their green cards were going to expire.